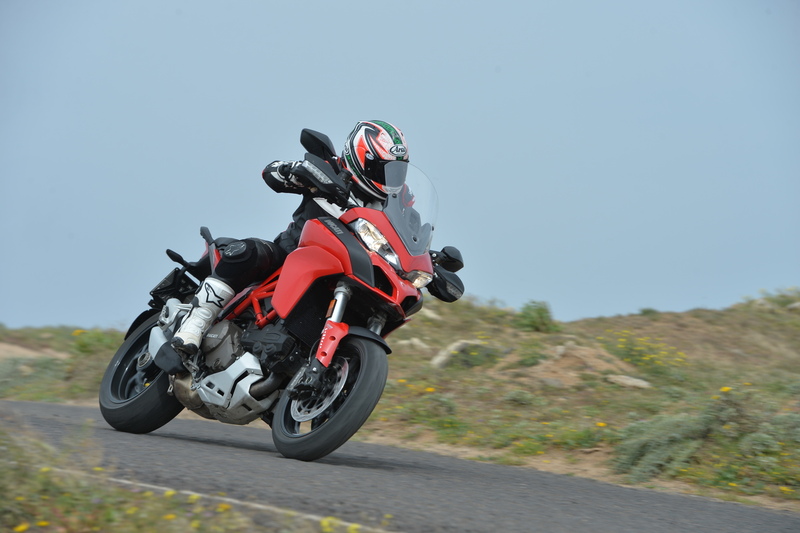 2015 Ducati Multistrada 1200 – first ride! 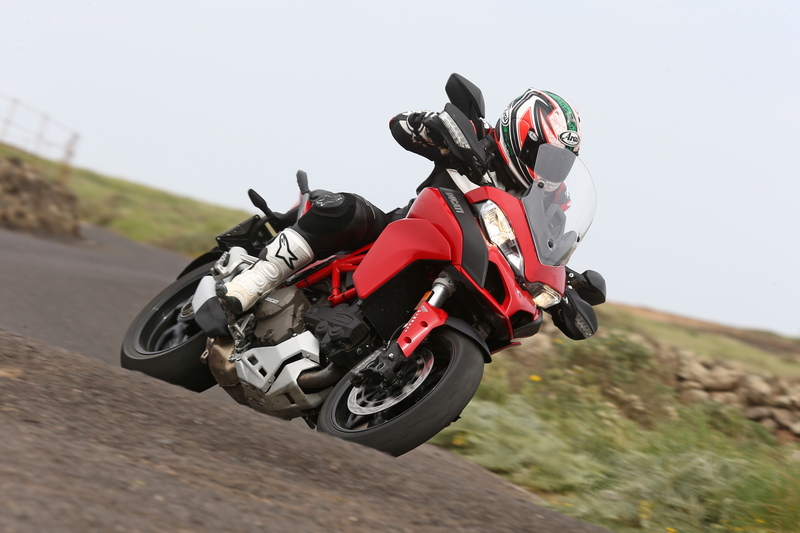 Ducati’s new Multistrada 1200 could be the most tech-laden bike ever. But is it any good? Al downloads the facts in Lanzarote. I’ve been here before. Lanzarote that is. 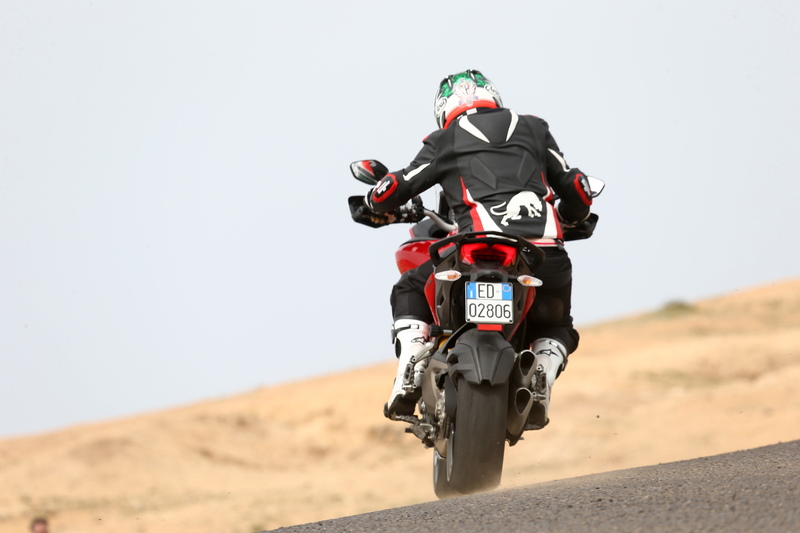 Riding a new Ducati Multistrada. 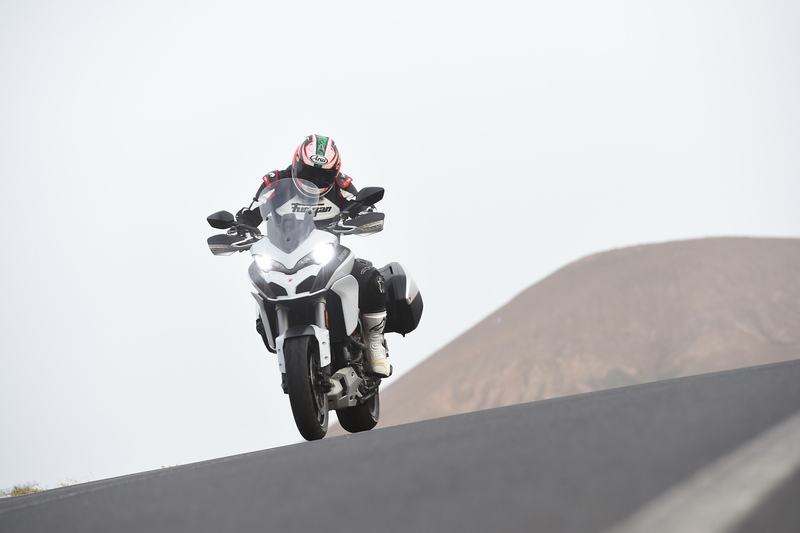 In fact, it’s five years since Ducati launched the first of the current Multistrada 1200 model, the Bolognan firm’s take on the full-bore mega-bhp adventure touring bike. 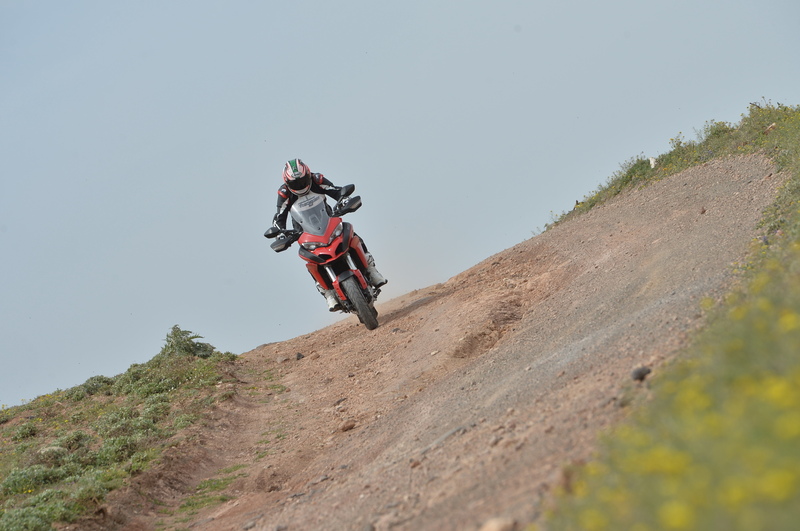 Where bikes like BMW’s R1200GS and Triumph’s Tiger had been happy to plow the big trallie furrow with second-division powerplants, Ducati went in large, basically throwing a version of its WSB competition engine into a tall, freaky-looking touring trailbike chassis, then finishing it off with a healthy dose of high-tech, useful design touches and flat-out real-world performance. An update in 2012 cemented the bike’s reputation as an incredible country-crosser, that could also do excellent service as a commuter, a green lane bimbler, and even a Sunday blasting backroads buster. With suspension, power, ABS and traction control all tweakable at the push of a button, the Multi took on many stradas with aplomb, and it’s a big favourite round here at SuperBike Towers. So, we’d have taken it personally had Ducati fucked things up with this new 2015 version. On paper though, it all looked like gravy. The Testastretta motor is no longer the firm’s top-spec superbike engine, but the Borgo Panigale boffins have given it the once-over in the shape of a comprehensive variable valve timing setup, the snappily-dubbed Desmodromic Variable Timing. The system – common in cars – uses pressurised oil to move the cam sprockets in relation to the shaft lobes, allowing a constant fine-tuning of the inlet and exhaust valve opening times. That means less of some stuff and more of others: reduced pollution emissions and fuel consumption, improved torque and power. The engine’s also got updated fuel injection, exhaust and quieter covers, mostly aimed at meeting very stiff EU-4 emissions regs. On the chassis front, the suspension is now by Sachs, with a Skyhook semi-active system on the ’S’ version, which also gets full factory superbike-spec stoppers, in the form of a set of Brembo M50 monobloc calipers and 330mm discs. Nice. The clever stuff gets even more interesting when you get to the electronics. The old bike wasn’t shy about flexing its silicon muscles, with four riding modes, ABS and traction control. But Ducati’s raised the digital game even more, with a gorgeous full-colour TFT LCD dashboard on the ’S’, fully-tweakable riding modes, traction, ABS, wheelie control and electronic suspension adjustment on the Skyhook system. Making life easy is a new keyless ignition and cruise control, while full LED headlights on the ’S’ have active cornering lights, which come on in a corner, illuminating your path. Much of the new electronics are based around a new IMU – inertial measuring unit – which uses lean angle sensors and accelerometers to analyse what the bike is doing in terms of lean, cornering and acceleration/braking, then using that info to tweak the ABS, wheelie control, suspension and headlights. 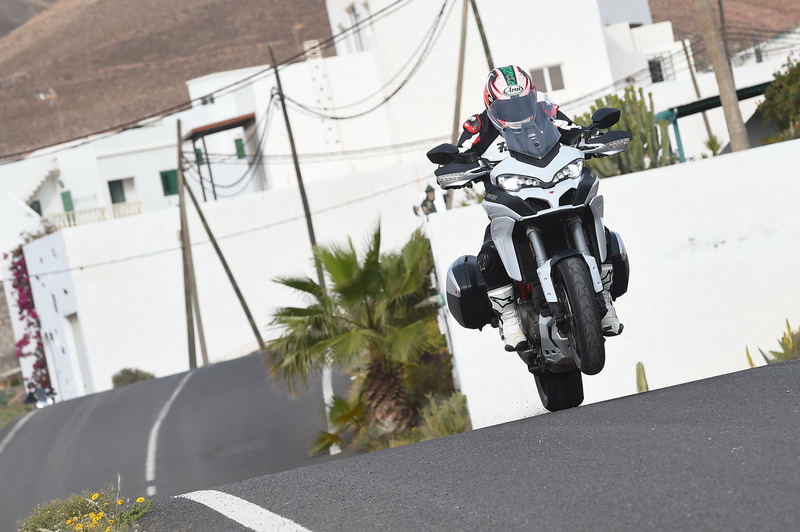 So as we prepare to set off on a fleet of saucy-looking ice-white Multistrada ’S’ bikes, there’s a lot to ponder. Will the electronics need a lot of fettling? Is it all going to be a bit nanny state? Can you still wheelie the bloody thing? The mild panic subsides as we get going though, and it all settles down. I click into sport mode, and at the first stop, I turn the wheelie control and traction control down, leaving the ABS and suspension as they are. Set the units to mph and mpg and get into the groove. 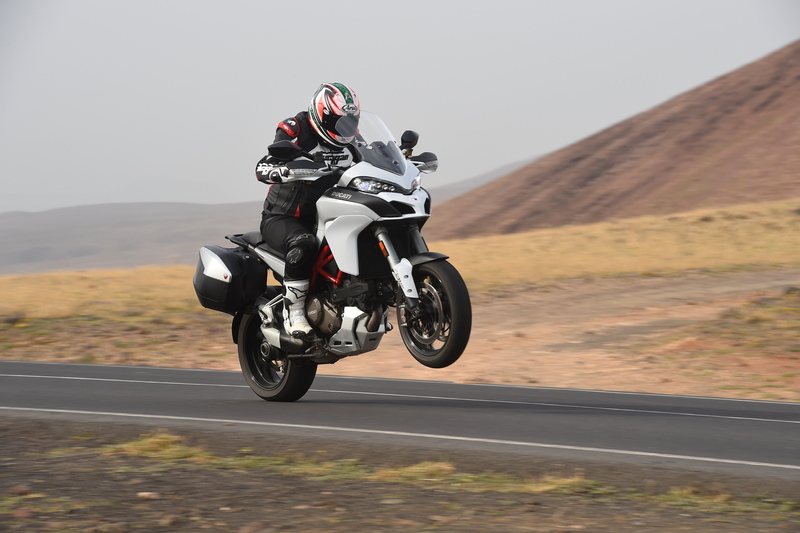 A lot about the new bike is familiar: the fairing is a bit wider and the screen seems taller, but it’s still recognisably a Multistrada from the rider’s seat. The new bars are fat and wide, and the steering lock – never bad – is now almost unfeasibly massive. If you can’t get this through a gap in London traffic, it’s time to break out the Oyster card. The dashboard is clear and crisp, and even the mirrors, often mere decoration on Italian bikes, are brilliant. But it’s the engine I’m concentrating on. It’s strong – bloody strong – from the off, with the growling grunt only a big twin gives you. But the DVT has added bulk to the torque curve, carrying on the thrust all the way up the rev range. It’s a bit like the trend for modern rugby players – once the massive blokes in the scrum could dish out and take the big hits, but they were pretty slow on the move. But professional sports science and better training means they’re now fast on the run as well as enormous. So the Multi dishes out big punches out of the bends, then keeps sprinting all the way down the straights. You can see 150mph on the clocks in no time, and there’s stacks of instant overtaking urge everywhere in the rev range, perfect for making your way past the lines of dawdling hire-car holidaymakers on Lanzarote. It’s not all perfect though. There’s a hint of vagueness about the throttle response on the new bike. Particularly the first ’S’ model I rode, where it felt like there was a little too much play in the twist grip. Added to a slightly retarded response at certain points in the rev range, together with the super-strong engine, and the result was a bit disconcerting. When you were in full attack mode, it’s all good. But on part throttle openings, trickling your way round long bends or negotiating traffic, it felt a bit like there was too much being thought about inside the committee of computers running the show, and I was yearning for the directness of a simple steel cable to the throttle bodies… Things improved over the course of the day though – partly down to me adjusting to the Multi, and partly down to the second bike I rode on Lanzarote feeling much more direct for some reason. I think if you rode one of these bikes every day, you’d quickly adapt, and would think nothing of it. You’d also quickly get used to the chassis. The brakes (on the ’S’ in particular) are excellent, with stacks of power and feel. The suspension is plush and controlled front and rear, soaking up bumps like a champ without ever feeling too soft or wallowing. 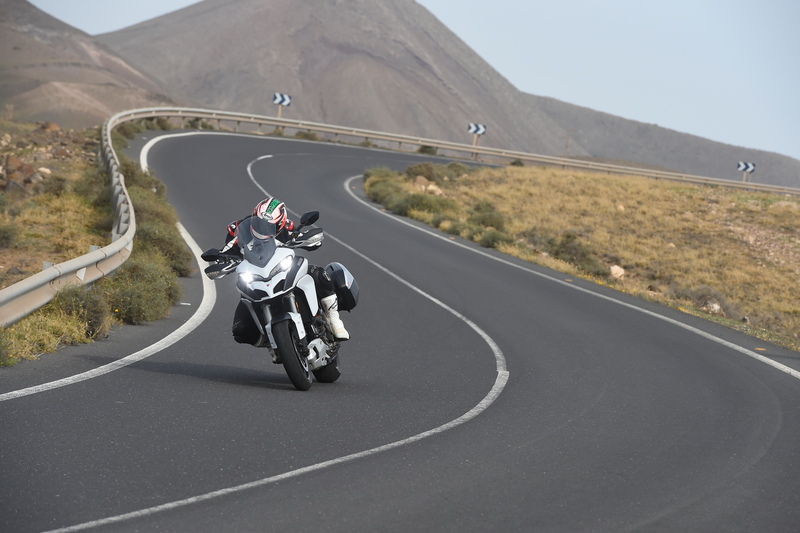 And the new Pirelli Scorpion Trail II rubber never let go even on the more polished sections of Canarian asphalt. The riding position was comfy and commanding for my 5’8” frame, although I did adjust the seat to its lowest position, which helped my stumpy pins reach the deck more easily. The screen adjusts up and down at the flick of a manual lever, making more complex systems from competitors seem daft.